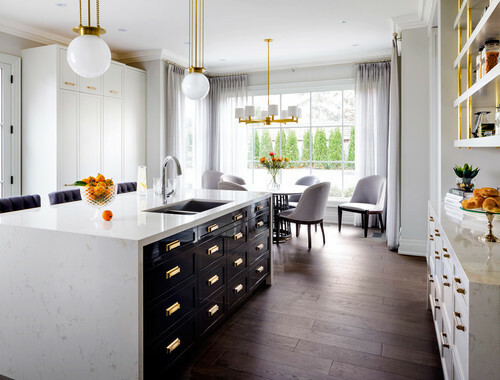 Whether you are planning for a full-scale remodel or are just looking to refresh elements of your kitchen, there’s some really exciting design trends emerging in 2019. Choosing to leave the stark whiteness or introducing some high tech to make life easier, this year is all about leaving behind the old dated kitchen styles and embracing new and dynamic looks. 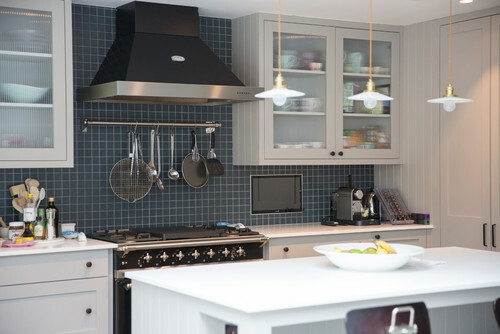 Here are five kitchen design trends to refresh your cooking space. While many homeowners still enjoy the timeless appeal of an all-white kitchen, bringing in distinctive hues to mix things up can still create a fresh and light-filled space. 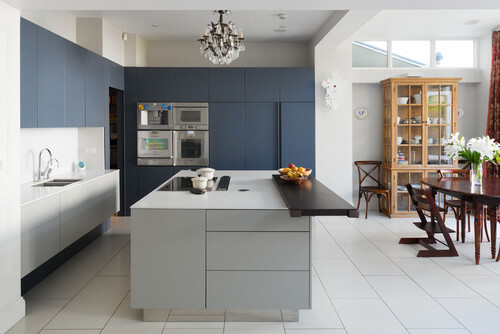 Introducing just one element of accent colour - through stools, pendant lights or a splashback to give your kitchen that pop and pull it all together is emerging as a popular design choice in 2019. For countertop materials, engineered quartz continues to reign supreme and for good reason. Engineered quartz is virtually indestructible and white marble quartz in particular, has a grainless surface and reflects the light much better, helping to create the appearance of a larger space. Many homeowners are embracing off-whites for cabinets and are moving away from stark whites to create a more intimate and cozier space. One of the easiest ways to create depth and sophistication into a kitchen interior is to introduce mixed metals for fixtures. Adding metallic accents when a neutral colour scheme has been adopted adds dimension with both colour and texture. There are a variety of mixed metal combinations that work in the kitchen: copper and silver, silver and gold or something less dramatic - bronze coupled with copper. For best results, choose no more than three metals, although the trend works best with two metals to avoid looking too busy. To achieve visual structure, choose a dominant metal and a secondary metal. A good rule is 70% of fixtures in your principal metal metal and 30% for your secondary metal. To achieve visual harmony, keep the choice of metals on the horizontal visual plane the same. For example, all your lighting pendants should be in one metal, while the metals on the vertical plane, like faucets and pull knobs should be identical to establish metallic equilibrium. Experimenting with finishes is a fantastic way to express understated style and sophistication in your kitchen space. Easy to clean with a wide range of colour options, 2019 is all about matte cabinetry and appliances. In the past, some homeowners have shied away from a matte finish, worried that it may look too flat and boring. One option to combat this concern is to combine two different colours for cabinets to create contrast and interest. Our favourite combinations include black and timber for a scandinavian look or blue and white for a modern french twist. Deep down, no one really wants a cookie-cutter kitchen and so craftsmanship and customisation is being embraced in 2019 to give the kitchen a homely touch. Specially designed sinks in warm copper or a colourful granite (in brown or black) can give a completely unique effect. For more personality and vibrancy, consider organic handmade tiles for a splashback or a carpenter’s made butcher’s block for a standout piece. 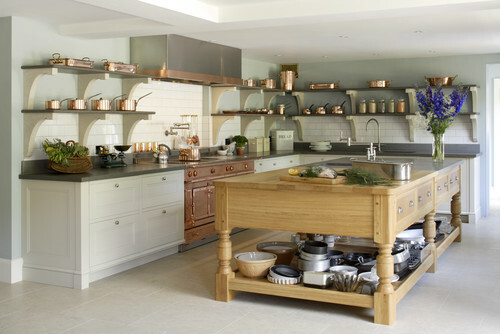 Displaying antique chinaware or brass saucepans on open shelving can also help create a bespoke kitchen. Tech is being introduced in 2019 to transform kitchens to become more low-maintenance and energy saving. Adding to induction cooktops, warming drawers and touchscreen-outfitted fridges that are included in most kitchen makeovers, Wi-Fi connected appliances are making kitchens more convenient and are improving functionality. With remote access through smartphones, you can monitor and control ovens, slow cookers and coffee makers without having to be at home. Fixtures can also make your kitchen smarter. More than half of upgraded faucets and filter systems are high-tech, improving water efficiency and include smart features such as touch-free activation, instant filtered cold and boiling water and no fingerprint coating. If you are overwhelmed by your options in designing a kitchen, Nu-Look is happy to provide you with advice on some layouts and features that will suit your style and taste. Get in touch with us today for a free consultation.